3. Share your selfie with #SunEasyTaxi n either Facebook or Twitter. Don’t forget to mention how much you love the #SunEasyTaxi cab. 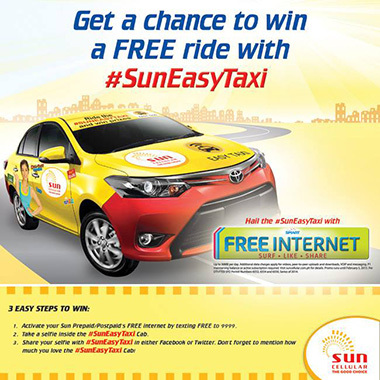 Get the latest updates on SUN Easy Taxi cab by visiting www.suncellular.com.ph/easytaxi or you can also check on Sun Cellular Facebook Page and UnliPromo Facebook page for more promo details and latest updates.